Trade show exhibits, newsletters and PowerPoint presentations were discussed during the first conference call for state accountancy board communications officers, moderated by Communications Committee Chair Sally Flowers on December 16. Approximately 20 states were represented on the call. 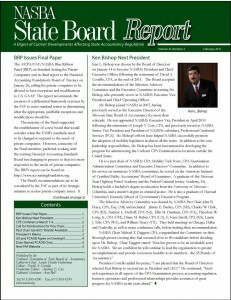 The Committee is posting recommended communications projects for the boards on its Web page at www.nasba.org. Boards were encouraged to send information on their successful communication projects to NASBA Communications Director Thomas Kenny at tkenny@nasba.org. A poll on board newsletters was recently conducted by the Communications Committee and future polls about other aspects of this topic are planned, with the results being shared on the Web page. Among the projects mentioned during the December call was the Texas Board’s Candidate Chronicle, which is produced twice a year and displayed on its Web site. The New Hampshire Board has developed a PowerPoint presentation for CPA candidates that it will make available to other boards. The boards in Illinois and Oklahoma have set up informational booths at their state societies’ trade shows. Ms. Flowers said the Communications Committee intends to develop public service advertisements that all boards could use to let the public know who the boards are, what they do, what licensees should do and how to contact the board.